The SharePoint Swiss Army Knife | Stories from a SharePoint Engineer who isn't afraid of Visual Studio. I am by no means a PKI/Windows Certificate Authority expert at the moment but it does seem that I’m starting to go down that route as I’m working on this project to deploy a SharePoint Extranet farm out in Windows Azure. One of the requirements have us setting up and supporting our own internal Certificate Authority. As I was going through some wonderful documentation by Christopher Delay, I came across 2 environment specific errors that were really frustrating. certutil -setreg CA\CRLPublicationURLs "1:%WINDIR%\system32\CertSrv\CertEnroll\%%3%%8%%9.crl\n2:http://pki.fourthcoffee.com/certenroll/%%3%%8%%9.crl\n3:ldap:///CN=%%7%%8,CN=%%2,CN=CDP,CN=Public Key Services,CN=Services,%%6%%10"
certutil -setreg CA\CACertPublicationURLs "1:%WINDIR%\system32\CertSrv\CertEnroll\%%1_%%3%%4.crt\n2:http://pki.fourthcoffee.com/certenroll/%%1_%%3%%4.crt\n3:ldap:///CN=%%7,CN=AIA,CN=Public Key Services,CN=Services,%%6%%11"
Assuming you update the CertEnroll URLs to match your environment, you may get the following error after you complete the CertUtil -CRL command in PowerShell. CertUtil: The directory name is invalid. CertUtil: The object name has bad syntax. certutil -setreg CA\CRLPublicationURLs "1:$env:windir\system32\CertSrv\CertEnroll\%3%8%9.crl\n2:http://pki.SubCA.local/certenroll/%3%8%9.crl\n3:ldap:///CN=%7%8,CN=%2,CN=CDP,CN=Public Key Services,CN=Services,%6%10"
certutil -setreg CA\CACertPublicationURLs "1:$env:windir\system32\CertSrv\CertEnroll\%1_%3%%4.crt\n2:http://pki.SubCA.local/certenroll/%1_%3%4.crt\n3:ldap:///CN=%7,CN=AIA,CN=Public Key Services,CN=Services,%6%11"
I’ve finally succumbed to the awesomeness that is cloud computing and have fallen in love with the possibilities of spinning up virtual machines at a moments notice. Can you imagine that? 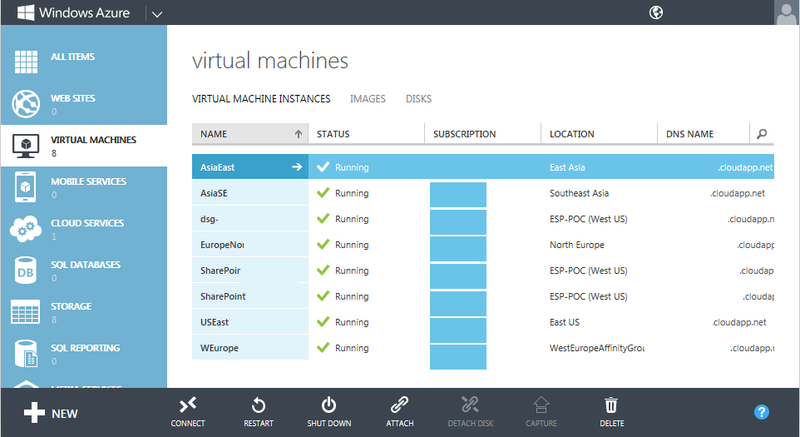 In minutes, you can practically host a virtual machine any where in the world! 1. Latency between your web front ends and database servers must prove to average < 1 millisecond over a ten-minute period. 2. Bandwidth between your datacenters must be at least 1 gigabit per second. Given that we haven’t been able to bend the laws of physics just yet, meeting these numbers prove to be a task that isn’t quite possible at the moment. So my dreams of having a geo-distributed SharePoint collaboration farm were crushed leaving me with a centralized farm to ponder about. But where in the world should this centralized farm be hosted? If you’ve been working with Azure then you probably already knew this, but if you didn’t, you’ll probably come to a day when you’re trying to ping various public websites only to receive “Request timed out” messages. A little bit of searching led me to a post by Rob Blackwell that describes using Eli Fulkerson’s tcping instead. Also inspired by Rob’s post, I was able to use tcping to record latency metrics (in milliseconds) between each of the Azure datacenters as well as from my office location in Aliso Viejo, CA. 1. Created a Small VM using the SharePoint template in each Azure datacenter. I used the SharePoint VM image because it already has IIS set up so I don’t have to fudge with setting up a default website to test. Also of note was the inability to create VMs in the US-North and US-South datacenters. I guess they don’t support VMs there. 2. Configured public/private endpoints for port 80 on each VM. 4. Logged all the data in Excel for analysis. Although this data isn’t going to be entirely representative of what the end users will experience, it gives us the ability to ball park the level of experience that users around the globe can expect in terms of latency. And if I’m not interpreting this data incorrectly, it looks like the US West datacenter will provide the best overall experience to a global set of end-users based on having the combination of lowest latency average to other geo-locations, lowest standard deviation of latency between the geo-locations and lowest maximum latency that was experienced during my testing. So there you have it. Go west! This one got me good… real good… I couldn’t find any documented fixes for this issue so here it goes! As briefly alluded to earlier, this is most likely a result of a SharePoint 2007 to SharePoint 2010 migration in which the SharePoint 2007 sites had blocked SharePoint Designer access by editing the site templates’ ONET.xml files. During the migration, you had forgotten about this tweak and the settings made aren’t transferred to the new servers (at least not for the XML definition files anyways). But unbeknownst to you, this change caused some entries to be made in the SPWeb’s property bag that did come along for the ride. Dun, dun, dun…. Thanks to a hint from Ethand from the SharePoint forums we can fix this issue with some nifty PowerShell. If you’re a SharePoint Manager fan, you can validate that the offending property exists by navigating to the properties node of the SPWeb and then finding the property name “vti_disablewebdesignfeatures2”. As expected, this property has a value of “wdfopensite” which is the trigger to not allow SharePoint Designer to connect to this site. I was hoping to be able to modify this value via SharePoint Manager, but it looked like a read-only property here so let’s shuffle our way over to PowerShell to do some real damage…er, I mean some problem resolution. After the update, you can validate by either calling the property again in PowerShell or viewing it in SharePoint Manager to confirm that the property now contains an empty value. Go back to SharePoint Designer (you may need to close it and re-open) and ta da! You’re back in business and all is well again. Boy, what a ride it has been! Can you believe this blog has crossed the 1 million views mark? It all started at the end of 2006, right around the beginning of the SharePoint/Office 2007 product cycles. After spending countless hours in newsgroups & SharePoint forums like MSDN and Tek-Tips giving and receiving help from others, I was inspired to set out with a New Year’s resolution in 2007 to start a blog of my own! I must admit, those first couple months were pretty rough with the view stats and even made me question whether or not it was even worth writing this stuff! Luckily, I was able to look at it like an online notepad of my own, to record my own SharePoint findings to be referenced later on. I was eventually spirited by some awesome questions and comments from all around the world and it was this thrill of being able to help others, regardless of what time zone they’re in, regardless of what language they spoke, that helped to define not only this blog but also myself and my role in the community. If anyone needs a good reason to start a blog, I can definitely say that it has opened a tremendous number of opportunities for me through the years. It has not only helped to improve my writing, vocabulary and communication skills, but it has also enabled me to work with awesome companies, meet awesome people, speak at user groups, conferences, and even exposed me to world of authoring real books! So if you can bare the time to put your thoughts down in a blog, I’d highly recommend it. As long as you genuinely contribute to the community, the community will be genuinely generous to you. But alas, all good things must come to an end right? No, I’m not giving up on SharePoint and I won’t stop contributing. But with the emergence of such great blogging communities like NBSP, the thriving MSDN forums and countless other SharePoint bloggers out there coupled with a slight shift in my own career priorities, the number of posts I put out will definitely be impacted. So with that said, I’ll leave you with some interesting stats about my blog below and see you when I see you! # This script will identify sites that have the Request Access email property set to the variable. $siteURL = "https://site" #URL to any site in the web application.